Extend the second riser of this 13' Manfrotto Combi-Boom Stand to its maximum, press a lever, and you have a stand with a two section boom arm. 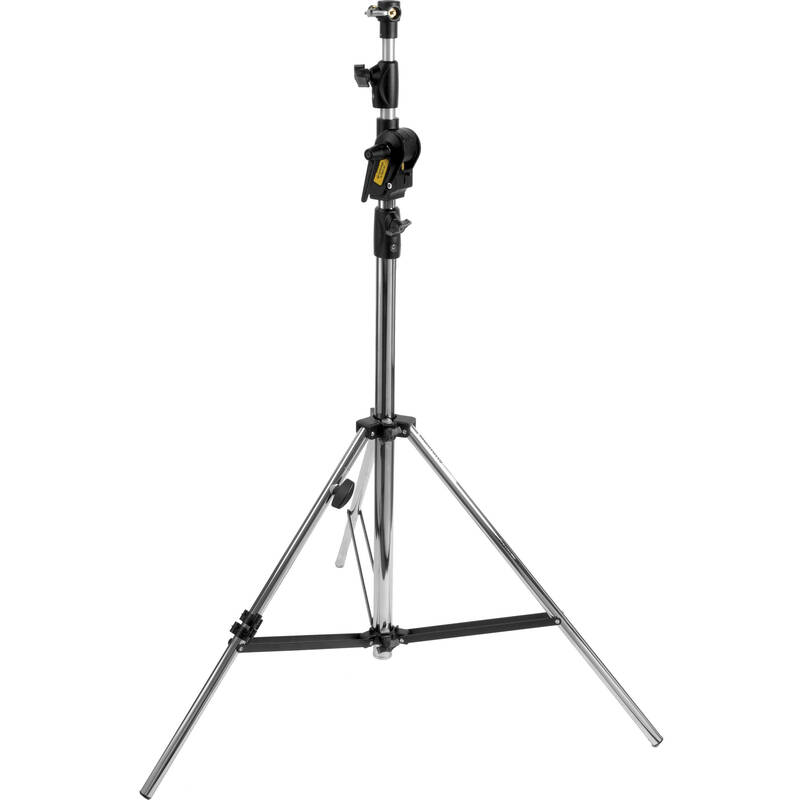 When used as a boom stand, this steel-based stand with 2 aluminum risers has a maximum load capacity of 11 lb - strong enough for a small light fixture with a small softbox or umbrella. Box Dimensions (LxWxH) 46.0 x 6.0 x 5.0"
Combi-Boom Stand with Sand Bag (13') is rated 4.3 out of 5 by 9. Rated 4 out of 5 by AllanF from Good sturdy stand, NOT air cushioned I'm basically very happy with this stand. It's sturdy and has good extension. I have an AB800 and with that on one end and a 15 pound counter weight on the other it can go out to full extension without getting bendy or anything. It is a bit heavy, so it's not something I think would try and take on location, but for studio work it has been great. Beware though, this stand is NOT air cushioned, as I found out the hard way, while moving the stand around a bit the top tier for some reason suddenly came crashing down and I came a couple inches away from getting a 15 pound weight to the head. Rated 5 out of 5 by Sevenstar from The best stand! Most incredible and versatile stand in my arsenal. Well worth the price! Make sure to get the 10 pound weight and wheels. Rated 3 out of 5 by Anonymous from Solid Stand I like the dual use of this stand (i.e. light or boom) and the durability. Although, adding my Einstein and the 47 Octabox (P.C. Buff), the stand had trouble holding the light/box up. After tightening as much as I could, I was worried that the handle would strip or break on the stem connected to the stand. I'm sure there is a better way to fix this issue but the stand is worth it. Rated 5 out of 5 by Colin from A Great multi-tasker This is a double-duty product-it can serve both as a stand and as a stand with a boom, which makes it a great value. It is especially great to carry on location, as you only have one thing to carry or lose, instead of a stand, boom clamp, boom arm, etc. It is stronger than it appears in the picture, and the boom arm can hold quite a load-I use my Speedotron brown line M11 heads with a snoot or reflector without worry. I have also used a small softbox on the M11 without a problem. If you are planing on using it as a boom, I would consider adding a second weight to the stand, down low, for safety reasons. The sandbag (which comes empty, BTW) is meant to counteract the weight on the boom arm. I would also recommend adding the caster/wheel kit if your intended use is as a hairlight, as they need more frequent repositioning than do lights on stands alone in my experience, and the setup can become quite heavy to lift or slide around. Rated 4 out of 5 by Nicholas Clint from Great solid and versatile stand Very sturdy stand that supports weight well even when fully extended. The counter weight works well to balance even heavy modifiers, but I did have an issue with my 50 octabox. Structurally it was okay, but I just couldn't tighten the small heads on the tightening screws enough to keep it from slowly slipping, resulting in the light sagging. It supported my 24 x 36 softbox just fine, however. I really like that you can move the 5/8 mounting pin from the end to the side if you wish for mounting when used as a boom. I am primarily going to use this with a clamp style speedlight mount (clamped onto the boom arm) and a Cheetahstand Ricebowl to mimic Broncolor's Deep Para ($$$$$), the telescoping boom arm acting as the focusing rod. HUGE value out of this stand when used in this capacity. Rated 4 out of 5 by 2much2cary from Sturdy, But not a good Boom Stand in MHO Lift and extend strobe + med. Softbox. It uses heavy weight components and in general very sturdy. But the Boom arm has no suitable stops in which to anchor a counterweight. It does have a hole at the very end, but that is it. Sandbags have to be attached to this end (only). I must use my 25lbs weights (that clamp to the extended arm) from my Manfrotto 025 Super Boom, or extend the arm back to get the mechanical advantage. Otherwise fine product. Rated 5 out of 5 by GermanM from Very good addition to the studio It's heavy and holds with no problem a strobe and soft box. Very versatile in both functions as stand and as a boom. Included sandbag with hook is super useful. Answered by: mohammad mehdi s.